The morning after the October 22nd terror attack in Jerusalem in which a three month-old baby was killed and eight other people injured, the BBC News website replaced its highly unsatisfactory report on the incident with another article titled “Israel’s Netanyahu accuses Abbas over Jerusalem car attack“. Although the unnecessary inverted commas around the word attack seen in the previous article’s various headlines did not appear in this one, the description of a “car attack” of course still fails to adequately inform audiences that this was an act of terror and indeed the BBC refrains from categorizing the incident as such itself. 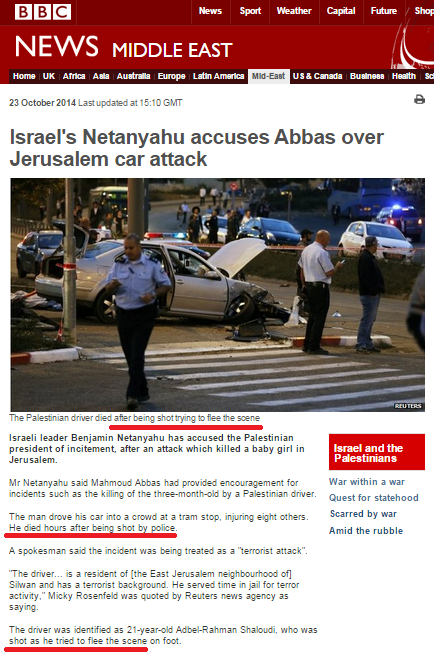 For some reason the BBC found it necessary to ensure that before readers had reached the end of the first six paragraphs of the article, they had been informed no fewer than three times that the terrorist was shot by the Israeli security forces: once in the caption to the photograph illustrating the report and twice in its text. “Israeli leader Benjamin Netanyahu has accused the Palestinian president of incitement, after an attack which killed a baby girl in Jerusalem. In a statement, Prime Minister Netanyahu accused the Palestinian unity government, backed by Mr Abbas’ Fatah party and Hamas, of fuelling such attacks. “This is the way in which Abu Mazen’s [Mahmoud Abbas] partners in government operate, the same Abu Mazen who just days ago incited to harm Jews in Jerusalem,” he said. Mr Netanyahu was alluding to comments by Mr Abbas in which he said Jewish “settlers” should be barred “by any means” from entering a disputed holy compound in Jerusalem known to Jews as the Temple Mount and Muslims as Haram al-Sharif. He described Jews visiting the site as a “herds of cattle”. However, as Khaled Abu Toameh has documented, Abbas’ incitement has extended beyond those comments as they are reported by the BBC. “During the 50-day military confrontation between Israel and Hamas in July and August, PA President Mahmoud Abbas and his senior officials in the West Bank made it a daily practice to incite their people against Israel. “Forty-eight hours before the Jerusalem attack, Abbas intensified his rhetorical assault on Israel by announcing that any Palestinian who is involved in property transactions with “hostile countries” (Israel) would be punished by life imprisonment with hard labor. Rather than clarifying to BBC audiences the scale and intensity of the incitement promoted by the Palestinian Authority president it so frequently describes as “moderate“, the BBC elects to present the issue in terms of “accusations” by the Israeli prime minister. 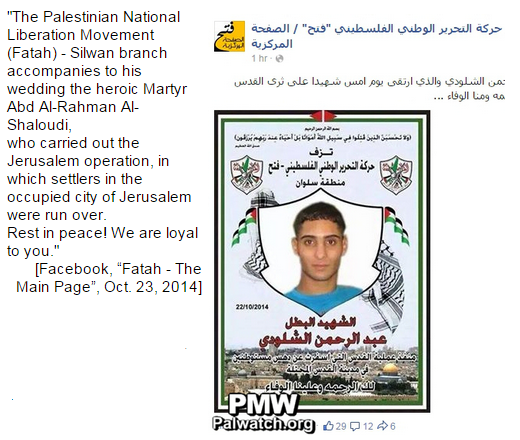 The fact that Abbas’ party Fatah published a ‘martyrdom poster’ praising the terrorist on its Facebook page and that Abbas’ advisor described him as “a heroic martyr” has not been reported to BBC audiences. Whilst the BBC has one the one hand frequently promoted the erroneous notion that the recent conflict between Israel and Hamas was a result of the lack of a peace agreement between Israel and the Palestinians and on the other sympathetically amplified the PA’s assorted unilateral moves to achieve international recognition of statehood whilst avoiding negotiations, the corporation consistently fails to provide audiences with information on the very relevant issues of the incitement and glorification of terrorism propagated by Palestinian leaders of all factions. Unfortunately, this report does little to correct those omissions or to begin to provide BBC audiences with the information necessary to enable their understanding of the part played by those factors in encouraging terrorism and making any negotiated peace agreement increasingly unlikely. maybe they are just illiterate. After all, the BBC is full of halfwits and morons. By saying ‘treated as a’ you already put virtual quotations marks around the phrase, you utter tossers.